Laurie Hawkinson, “Cinetrain,” Thesis 1982-83. Faculty John Hedjuk, Anthony Candido, Peter Eisenman, Donald Wall, and Regi Weile. Participants include: Andrew Kovacs, Caroline O’Donnell, Bryan Young, Deborah Garcia, Zenia Koreitem. Saturday, December 1st from 9:30am -5:00pm at the Frederick P. Rose Auditorium, at 41 Cooper Square. The event is free and open to the public. General public should reserve a space. More info and registration HERE. 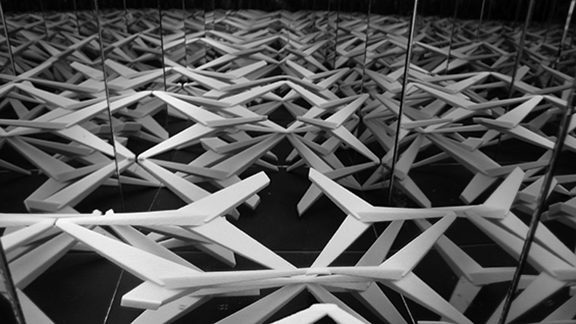 Hashim Sarkis will lecture tomorrow, Friday Nov. 30th, at The Cooper Union. 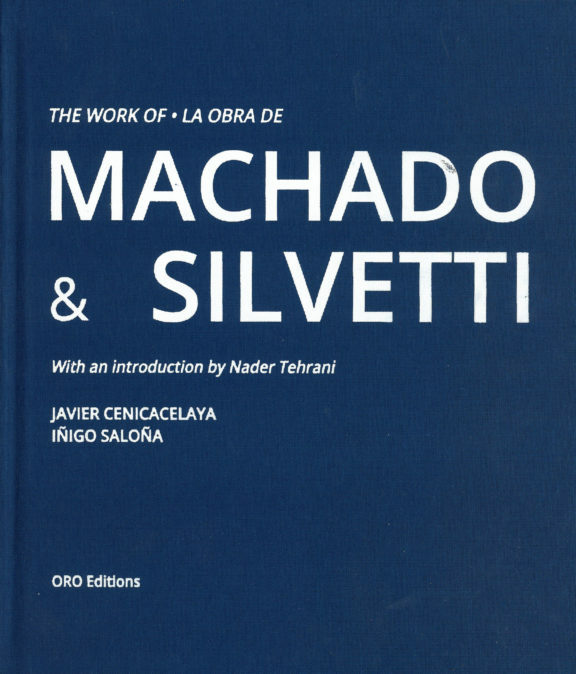 The lecture will be held at 6:30pm in the Frederick P. Rose Auditorium, at 41 Cooper Square (on Third Avenue between 6th and 7th Streets). More info HERE. 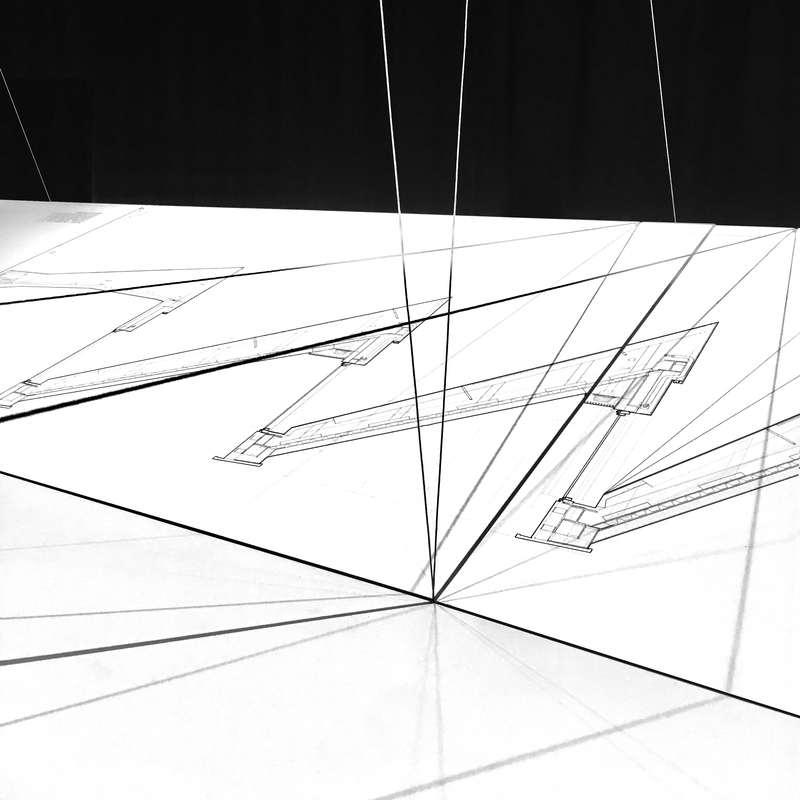 Tonight from 6:30pm – 9:00pm Cecil Balmond with lecture in the Frederick P. Rose Auditorium, at 41 Cooper Square. The event is free and open to the public and is approved for 1.5 LU | HSW Continuing Education Credits. More info and registration HERE. Tanderrum Pedestrian Bridge has won a 2018 Architecture MasterPrize for Urban Design! 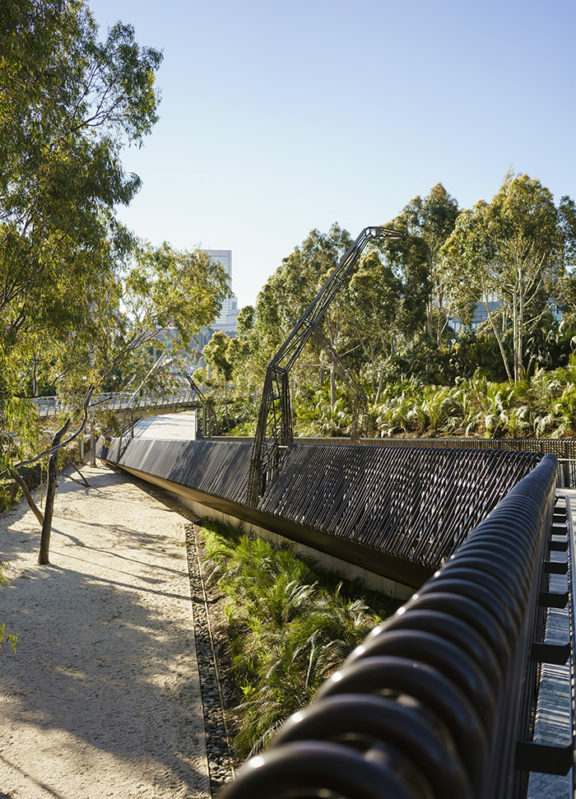 The Tanderrum Bridge was a collaboration with Melbourne-based John Wardle Architects. More about Tanderrum Bridge HERE. See all the 2018 MasterPrize winning projects HERE. 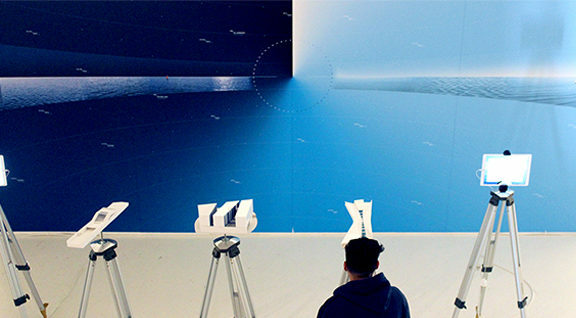 The William Cooper Mack Thesis Fellowship Lecture: Digital Materiality in Architecture is being presented at The Cooper Union tonight with lecturers Meejin Yoon and Fabio Gramzio. Nader and Michael Young will moderate. 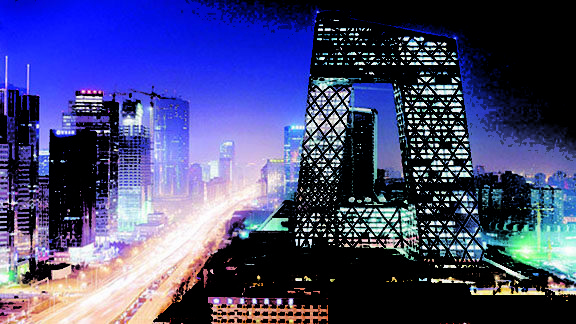 The lecture will be held in The Great Hall in the Foundation Building at 7 East 7th Street. While you’re there, make sure to stop by the current exhibition, Archive and Artifact: The Virtual and the Physical, currently on display in the Arthur A. Houghton Gallery! 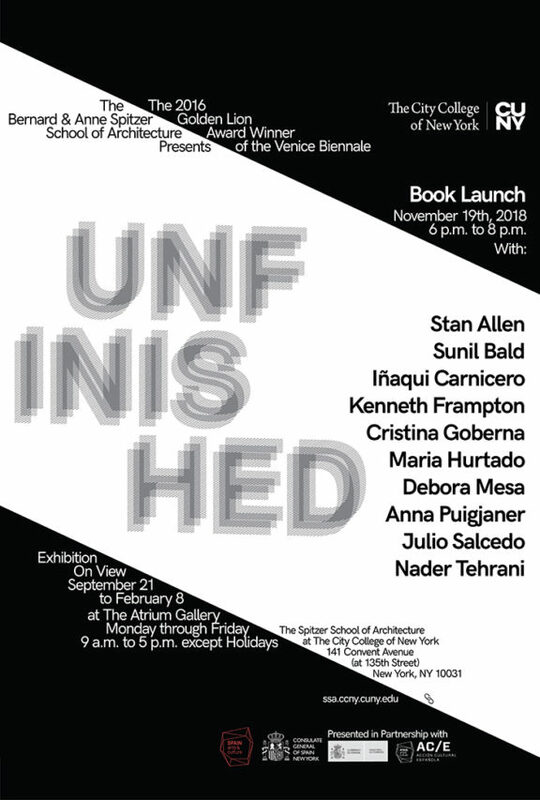 Nader is taking part in a panel at the UNFINISHED book launch at CUNY’s Spitzer School of Architecture Monday at 6pm. UNFINISHED explores projects from the Spanish Pavilion at the 15th Venice Architecture Biennale, more info on UNFINISHED can be found HERE. 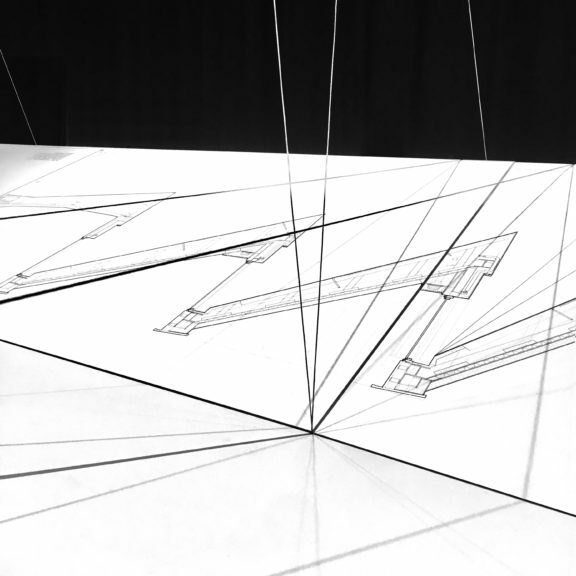 The Tectonic Grain is a textual and visual array which draws from this experience of designing space for design. The exhibit’s unique layout acts as both model and statement. 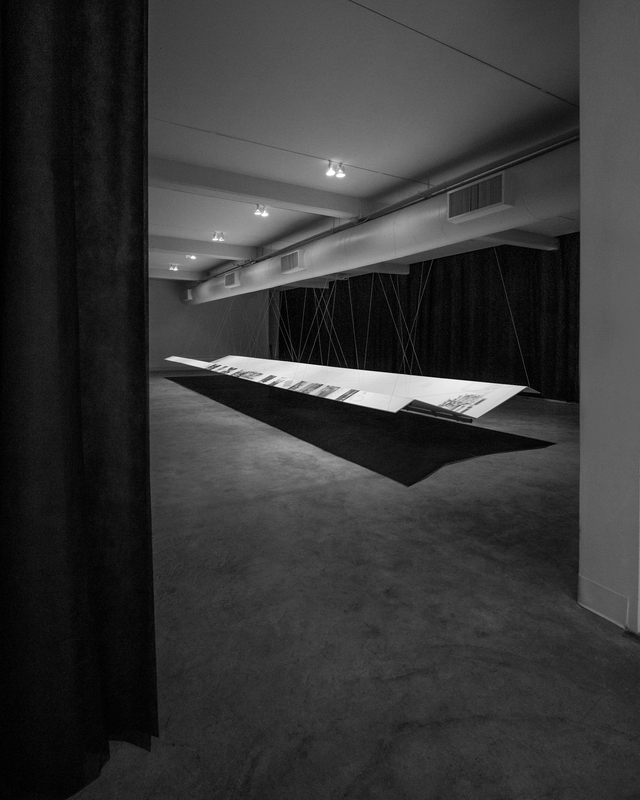 A lecture given by Nader of the same name on October 24th opened the exhibit and serves as a supplement to the exhibit. To read the corresponding essay, click HERE. To learn more about The Tectonic Grain and the Stubbins Gallery at the Georgia Tech College of Design click HERE. 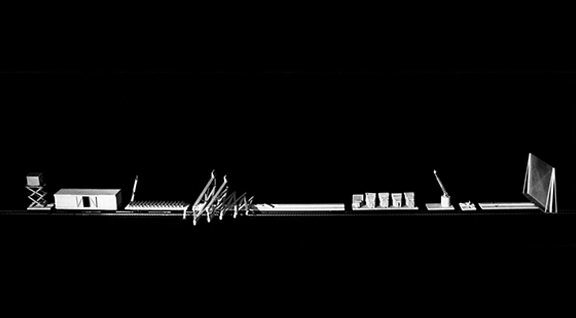 NADAAA approaches architecture with an understanding of a shared ability between academia and its own buildings to teach and challenge the conventions of built space. 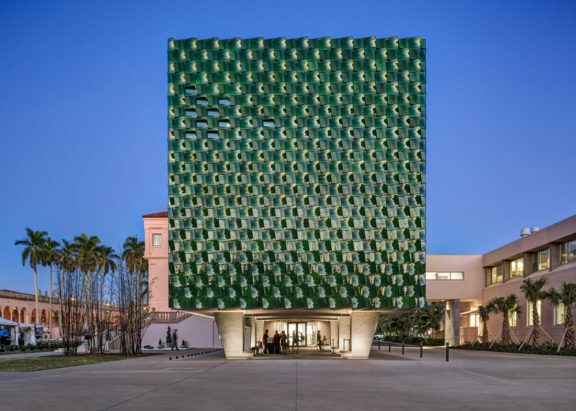 NADAAA’s work includes three schools of architecture and design: The Hinman Building at Georgia Tech, the University of Melbourne School of Design, and the Daniels Faculty of Architecture at the University of Toronto. 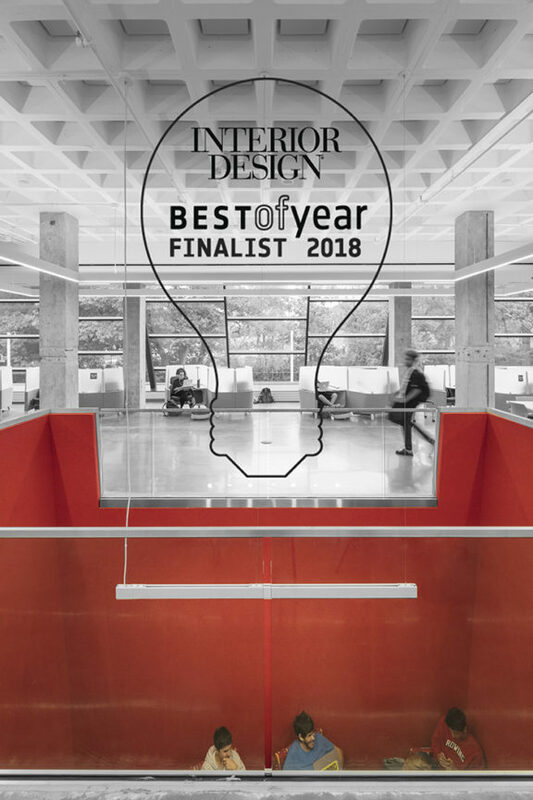 Consequently, NADAAA integrates within its practice an extensive understanding of design schools and the structural and circulatory factors that impact learning about design. 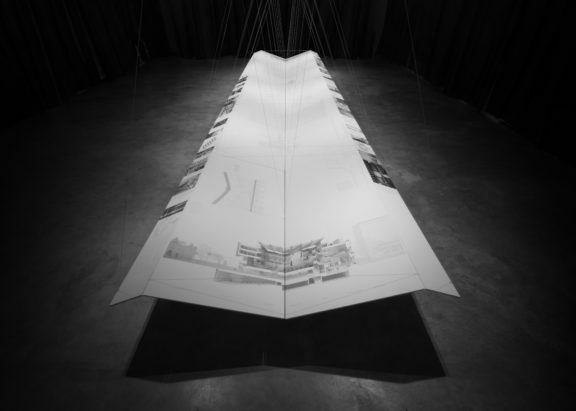 In the Atlanta and Melbourne projects, research on suspension became a transformative pedagogical tool. 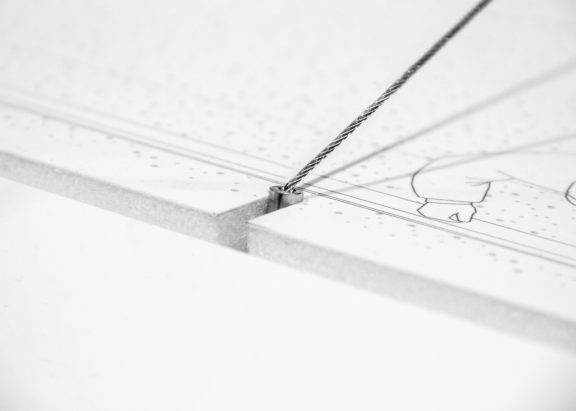 At Georgia Tech, we used the gantry crane above to delicately suspend an entire studio space – “the crib” – in order to maintain the flexibility of the ground level. In the Melbourne School of Design, where there is no budgetary allocation for dedicated studio space, 22 meter LVL beams spanned the atrium and formed the structure for a totemic suspended structure that served as the only dedicated series of studio spaces. The structure is massive and volumetric at its top, extending down to the studio walls in a kind of bas-relief, and eventually thinning out to plywood veneers at its base, where the surface of the cladding serves to create a coffered acoustic ceiling that hovers above the great hall. For the Daniels Building in Toronto, while the idea of suspension was not a motivating force, the integrative mandates and lessons of Atlanta and Melbourne projects became instrumental in the transformation of the design. When the concrete shell roof structure was challenged, the project was virtually brought to its knees in a moment of truth, as it were, effectively on the verge of compromising the building’s most salient feature. The question, for us, was whether this roof was a materially driven idea, or rather just about the integration of structural illumination, environmental, and hydrological performance, as the latter became to dominate our thinking, we redesigned the structure more economically in steel, while keeping its essential figure and performance intact. Composed of a layered system of parts, the steel I-beams with corrugated steel deck, covered with light gauge structs, gypsum board sheets with radiant panels, and a coating of paint. Thus, the paint shows no grain, as such, the most characteristic feature of the building resides in the morphological grain of the roof itself. Spectrum, MIT’s publication for friends and supporters, recently provided an update on the future Kendall Square. Here, MIT President Rafael Reif explained that the boundaries between campus, community, education and entrepreneurship will blur. 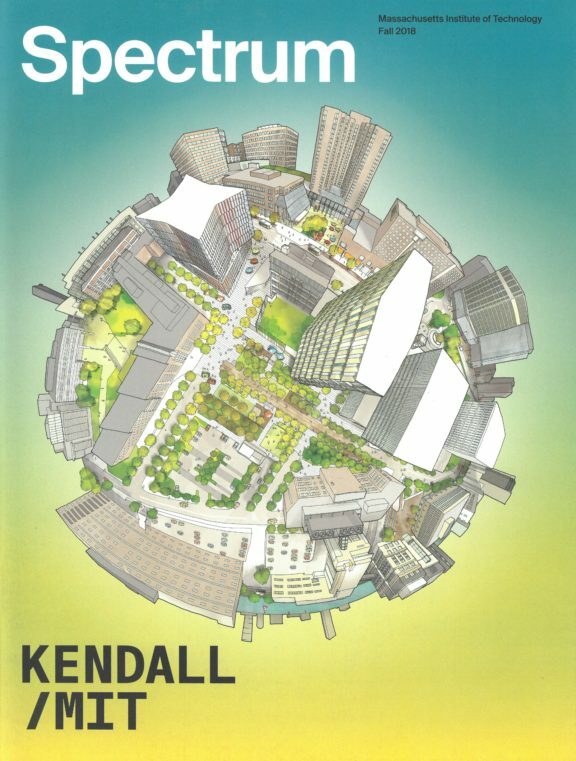 “Once the cranes leave town, we’ll be left with a Kendall Square full of possibility for the Institute, the region, the nation, and the world… If you haven’t been to Kendall Square recently, I hope you’ll stop by for a visit. You’ll be amazed by the progress we’re making.” Read the full article in Spectrum HERE. 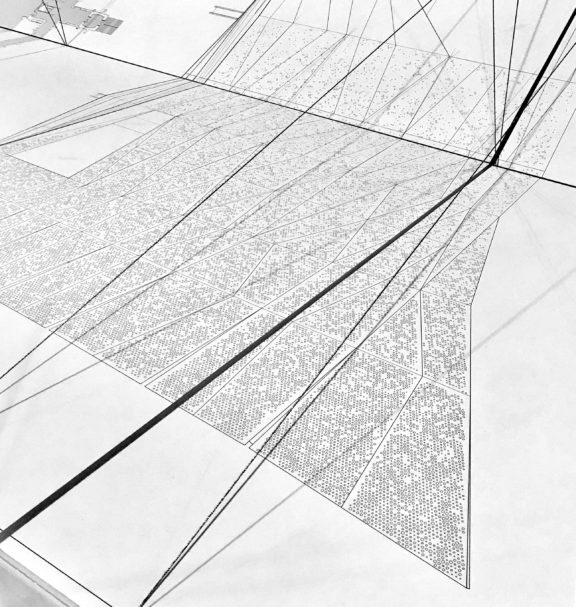 More info on NADAAA and Perkins+Will’s collaboration on the MIT Site 4 project at Kendall Square can be found HERE.